Nissan Approved Tire Center Services start with expert technicians that know your Nissan vehicle better than anyone else. Our team of expert technicians is paired with a robust inventory of only Nissan approved tires that have been rigorously tested for fit and performance on your specific Nissan vehicle. Rest assured knowing that if you bring your premier Nissan vehicle to the Lang Nissan at Mission Bay Approved Tire Center you will get service with an expert and will be given many tire choice options to get you the driving experience that you expect. If you live in our region and drive a Nissan, the best place to get any tire service is with us at Lang Nissan at Mission Bay. We will schedule all of your tire services to be completed by an expert with special training on your Nissan vehicle and will only use genuine Nissan approved tires to get you the driving experience and longevity that you expect. The tire service experts at Lang Nissan at Mission Bay have been trained to help you select the right tires that will maintain both the character and performance of your Nissan model. We only recommend installing genuine Nissan Approved tires because they have been subjected to rigorous performance testing to guarantee they will give our customers what they expect. 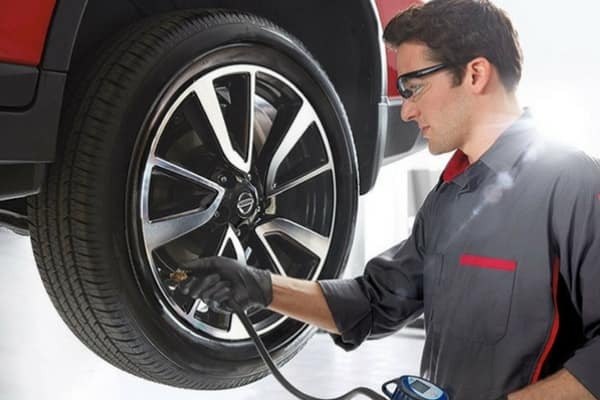 If you have any kind of tire service needs, schedule an appointment today at Lang Nissan at Mission Bay to have a certified technician give you genuine Nissan Approved tire service.